In the midst of the rush to pass significant US tax reform, a conference on state and international tax incentives illustrated progress in the analysis and evaluation of government incentives. The American Tax Policy Institute conference had panels on assessing state and local tax incentives, international tax incentives, tax competition, and using evidence-based tax incentive policymaking. 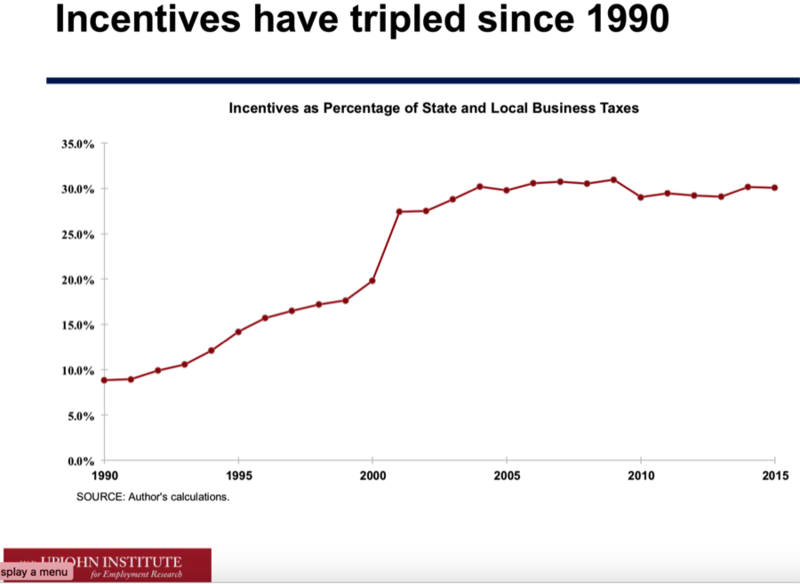 Tim Bartik of the Upjohn Institute presented a new database tracking five types of tax incentives over 26 years covering over 90% of the US economy. This public database will be an invaluable resource for state and local tax policy analysts. Other panelists noted that non-tax incentives also play a major role in state and local governments’ economic development efforts. New data from state and local government financial reports will start being available shortly as a result of the Government Accounting Standard Board’s Statement 77 on tax abatement disclosures, which will help identify hidden tax incentives. Jeff Chapman of The Pew Charitable Trust led a roundtable of three state officials responsible for evaluating state tax and non-tax incentives. The Pew Charitable Trust project is providing states with best practices and evaluation tools, as well as a state tax incentive evaluation-rating tool. Tax competition for mobile investment, workers and tax revenues also is occurring at the country level. This can take the form of competition in tax rates, patent boxes, tax incentives, as well as with base-erosion and profit-shifting facilitation. The Platform for Collaboration on Tax, a joint effort by the IMF, OECD, UN and the World Bank Group, is providing capacity-building support to developing countries, including a toolkit for evaluating investment incentives. More analysis and evaluation of existing tax incentives is needed at all levels of government. The current US tax reform proposals repeal many tax expenditures, often with no empirical analysis or evaluation. Repealing tax expenditures to lower individual and corporate tax rates has some appeal, and would make the federal tax code simpler. However, government intervention for many socially-desired activities is done through tax expenditures or non-tax grants or subsidies. The House bill repeals the exclusion of students’ qualified tuition reductions, without any hearing or empirical evaluation. Reducing incentives for investment in human capital to pay for tax incentives for physical capital investment and general tax cuts should be analyzed and evaluated before such a change is considered.